We imagine the child as a tree, capable of learning and growing on its own, making its own choices as to which way it bends its branches. We believe that children are capable, competent, curious, creative, active and self-motivated. We believe in promoting children's sense of agency and encouraging them to see themselves as competent members of society. The strong roots of belonging represent our belief that a strong sense of belonging allows children to learn and grow to their fullest potential. This sense of belonging is reinforced by our rich soil of Principles seeing the rights of the child as paramount and building secure, respectful and reciprocal relationships with children, having high expectations and viewing children as successful, competent and capable learners, promoting equity, inclusion and diversity, valuing Aboriginal and Torres Strait Islander cultures, respecting and supporting the role of parents and families and building strong partnerships with them, having high expectations of our practice and continuing to improve through ongoing learning and reflection. Our trunk of being represents our value of the here and now for children. Just as we recognise that trees grow at their own pace - so do children. We believe in allowing children the time to get to know themselves as they are now, to build and maintain relationships with others, to face challenges and enjoy the simple pleasures of day to day life. The branches of becoming represent the five broad directions in which our educators facilitate children's learning as guided by the Early Years Learning Framework and the Queensland Kindergarten Guidelines. 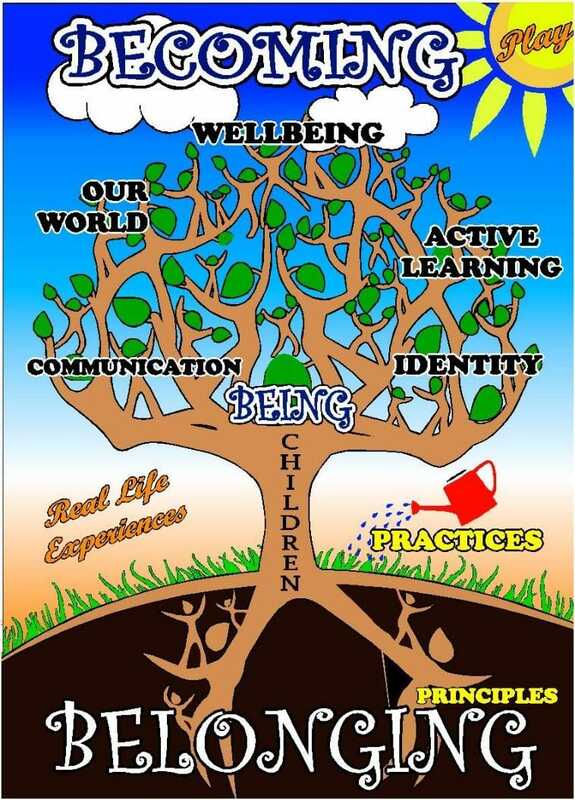 These include Identity, Our world, Wellbeing, Active learning and Communication. This learning is enriched by the Sunlight of play and real life experiences. We understand and value play and real life experiences as the most effective contexts for learning in the early years.Play and real life experiences and associated social interactions help children to build and strengthen brain pathways, develop social competence, build confidence, resilience and a sense of agency. The Watering can of Practices represents the practices of our Educators which extend children's growth and learning holistic approaches, responsiveness to children, intentional teaching, learning through play, continuity of learning and transitions, assessment for learning, learning environments, cultural competence.